Chicago-based Joe Policastro Trio returns to Columbus this weekend with a special set list in honor of Valentine’s Day. Joe Policastro Trio performs “Modern Love Songs” in its debut at Notes on Friday, February 15th at 9pm (Doors at 8pm) – tickets are available here. While the band is touring in support of its fourth album, Nothing Here Belongs, released February 8th, Friday’s program will highlight a wide range of love songs, drawing from the Great American Songbook to classics of the 1970’s and 1980’s. 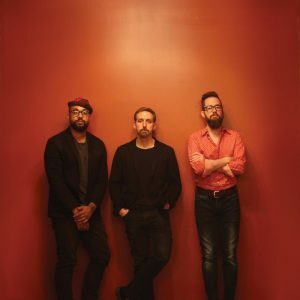 The trio of Joe Policastro (bass), Dave Miller (guitar), and Mikel Avery (drums) is renowned for their detailed and provocative takes on popular song – read our review of 2017’s Screen Sounds here. Keep reading for full details from the band, as well as video, and get ready for an intimate look at some past favorites tuned for the Valentine’s season. Hailed by Downbeat for its “deft analysis of choice repertoire,” and by The Chicago Reader for its “diversity of approaches to all kinds of source material,” Chicago-based Joe Policastro Trio make its debut at Notes! For this special Valentine’s Day weekend concert, the trio will be presenting a program of “Modern Love Songs” with their characteristic spin on songs of love, loss, and redemption from the Great American Songbook to popular songs from the likes of Stevie Wonder, Leonard Cohen, a-ha, Bruce Springsteen, Prince, and others. The band is touring in support of its fourth album, Nothing Here Belongs. The new release follows in the wake of West Side Story Suite (2013), POPS! (2016) and Screen Sounds (2017), all of which highlighted the trio’s ability to remake unlikely songs in its own raw, highly idiosyncratic fashion. Nothing Here Belongs, by contrast, for the first time showcases the trio’s captivating body of original music while also including characteristically bold arrangements of songs by Bruce Springsteen, The Talking Heads and Santo & Johnny. True bands are a rarity in jazz these days, especially ones who hone their craft as consistently as this one does. Beyond Chicago, the band has been extensively playing together throughout the US and Canada having even performed for President Barack Obama. As sidemen, Joe Policastro (Phil Woods, Howard Alden, Pat and Debby Boone, Jeff Hamilton, Diane Schuur), Dave Miller (Clarice Assad, Patricia Barber, Algernon), and Mikel Avery (Joshua Abrams, Theaster Gates, Rob Mazurek) have performed and recorded with a wide array of musicians but dedicate collectively to this trio.